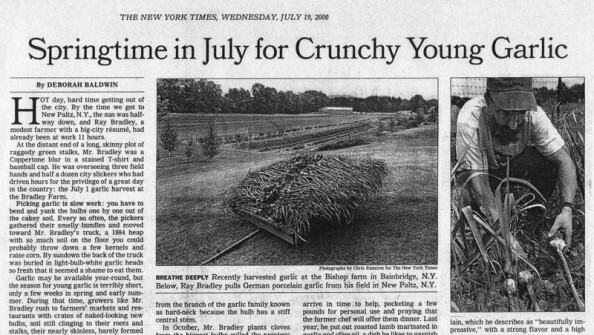 This article, Springtime in July for Crunchy Young Garlic, was published in the NY Times on July 19, 2000. Garlic may be available year-round, but the season for young garlic is terribly short, only a few weeks in spring and early summer. During that time, growers like Mr. Bradley rush to farmers’ markets and restaurants with crates of naked-looking new bulbs, soil still clinging to their roots and stalks, their nearly skinless, barely formed cloves as crunchy as Granny Smith apples. Want to know about those curly scapes that show up at the market every spring? In October, Mr. Bradley plants cloves from the biggest bulbs culled the previous year… Come spring, the cloves send up long green shoots, which curl like a pig’s tail. Garlic farmers chop them off to discourage the plants from concentrating on flower production. More important, the shoots yield a by-crop called scapes, which make a nice side dish sauteed in a little butter or olive oil. You can read more about Ray and the garlic harvest at Bradley Farm in the full article at nytimes.com.